In the Western classical tradition, Homer Ancient Greek: Ὅμηρος, H�mēros), is the author of the Iliad and the Odyssey, and is revered as the greatest ancient Greek epic poet. These epics lie at the beginning of the Western canon of literature, and have had an enormous influence on the history of literature. When he lived is controversial. Herodotus estimates that Homer lived 400 years before Herodotus' own time, which would place him at around 850 BC, while other ancient sources claim that he lived much nearer to the supposed time of the Trojan War, in the early 12th century BC. For modern scholars "the date of Homer" refers not to an individual, but to the period when the epics were created. The consensus is that the Iliad and the Odyssey date from around the 8th century BC, the Iliad being composed before the Odyssey, perhaps by some decades, i.e. earlier than Hesiod, the Iliad being the oldest work of Western literature. Over the past few decades, some scholars have argued for a 7th century BC date. Some of those who argue that the Homeric poems developed gradually over a long period of time give an even later date for the composition of the poems; according to Gregory Nagy for example, they only became fixed texts in the 6th century BC. The question of the historicity of Homer the individual is known as the "Homeric question"; there is no reliable biographical information handed down from classical antiquity. The poems are generally seen as the culmination of many generations of oral story-telling, in a tradition with a well-developed formulaic system of poetic composition. 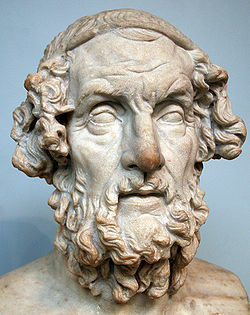 Some scholars, such as Martin West, claim that "Homer" is "not the name of a historical poet, but a fictitious or constructed name." The formative influence played by the Homeric epics in shaping Greek culture was widely recognized, and Homer was described as the teacher of Greece. Homer's works, which are about fifty percent speeches, provided models in persuasive speaking and writing that were emulated throughout the ancient and medieval Greek worlds. Fragments of Homer account for about half of all ancient Greek papyrus finds.